Fort Knox Titan Vaults compete head to head with the best. More steel equals more security when you need solid, heavy protection. Many quality features & reasonably priced. This is Fort Knox's most popular Vault. Legendary protection while living within your budget. Durable granite finish & a handsome appearance. The Maverick series maintains most of the standard features found on the Vault lines. Fort Knox Vault Doors protect large collections. Have your own Vault or "Panic Room." "With a comprehensive lifetime warranty, the industry's thickest steel, full fire protection, totally custom interiors and the ability to create a vault that fits your exact desires, Fort Knox stands alone at the top of the mountain." From the top of the line Legend to the Defender, the quality of their safes shows through. When only the best will do, Fort Knox fits the bill. Due to the completely customized & personalized features of Fort Knox Vault Gun Safes, these safes require Special Ordering. If you'd like a quote on any model please give us a call at 800.827.7534 or email us at info@deansafe.com. With most standard gun safes on the market today, you'll find body's with 12 gauge steel or lighter, composite doors with unclear or unknown compositions inside, a skip welded body and fast machinery process that leaves the safe less than secure. With a Fort Knox Vault the reinforced steel door must include a solid steel plate that runs the entire length and width of the door. The entire vault is constructed of 10 gauge or thicker steel and provides clear, detailed descriptions of the materials used in construction. The joined edges must have continuous, penetrating welds that greatly enhance the security of the vault. While most "safes" appear to be secure, many are not even UL listed, don't include the most basic relocker system and have locking mechanisms that appear strong but have weak internal components hidden behind the firewall or back of the safe door, hidden from the customers view. With a Fort Knox Vault, you get guaranteed UL listed certification, an absolute minimum of 1.5" locking bolts and multiple relocking devices that deter a burglar every stop of the way. A fire rating is only as good as the test that verifies it. With several safe manufacturers performing their own private testing using non-standard measurements and incorrectly assessing the internal safe temperatures, it's almost too easy to confuse a customer who is only able to see the impressive "2 hour rating". The sheetrock fire material of unknown thickness or composition and glued in material lead to skewed data results and poor performance when you need it most. When it comes to Fort Knox Vaults, the internal temperature must not exceed 350° for a minimum of 90 minutes in a 9 sensor fire test. The Fort Knox fire test is performed to hit 1200° within the first 10 minutes and rise steadily to over 1680° which not only mimics how a standard house fire occurs but exceeds it. They place C-rated fireboard on all sides and hinges and permanently bond the fire material to the vault without glue or other accelerants. The door seals are designed to prevent hot and cold smoke damage, a huge matter of importance when it comes to keeping paperwork and other valuables safe inside. Most Gun Safes have a nice fine print in their warranty that exclude features like the lock, paint and other various parts of the safe. They also will rely on the home-owners insurance policy to provide inital estimates of damage and only pick up where the insurance leaves off. 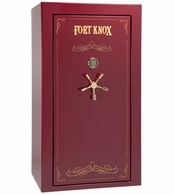 Fort Knox Vaults are backed by a comprehensive lifetime factory warranty that doesn't rely on the home owners policy and fully covers your vault. You've worked your entire life for what you have. Whether you want to protect priceless family heirlooms, an extensive gun collection, cash or gold, why trust anything less than the best. Make the right choice and go with a Fort Knox Vault.